Unlimited Global Skins – Now you can change your skin to any color you want. With in few mins, by configuring the global color, anchor links color and background options. Easy Drag & Drop Menu – SportsMag is compatible with WordPress 3.0 Navigation feature. Now you can set your own navigation menu by simply dragging items in Menu. Automatic Thumbnails – Gives you an option to switch between Native thumbnails & Timthumb, It gives you full control on selecting images to show on homepage and resizes them automatically. Theme Control Panel – Now add your logo, customize navigations, setup featured categories & ads in just 5 mins. Long story short, You can setup awesome professional Sports Magazine in few minitues. 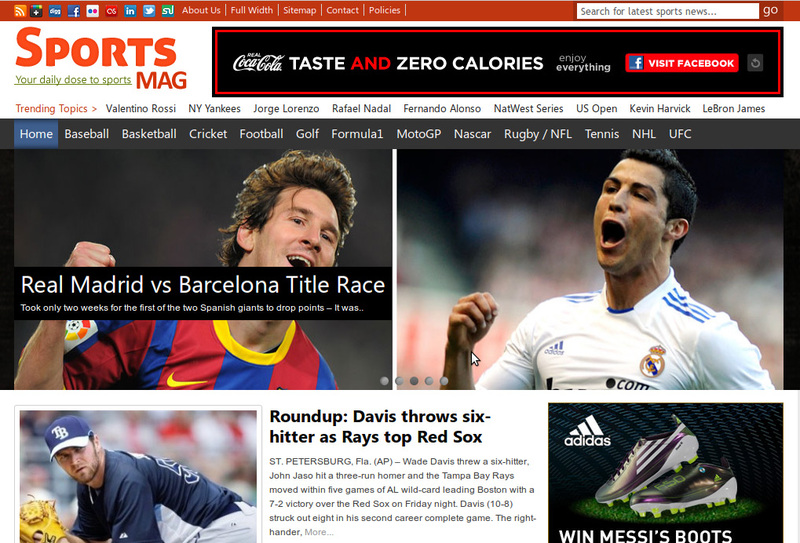 Advertisment Options – SportsMag has 9 different advertisement placement areas with on/off option, Plus an ad widget for sidebar to add anywhere in sidebar without adding title.